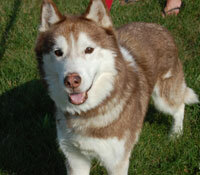 Nieko is a handsome red and white husky that has traveled a long and hard road and we are truly amazed by him. He was found wandering on a road in the Poconos area ~ tired, alone and very underweight. Sadly, we will never know Nieko’s past but we do know he is safe and happy now and his future will be even better when he finds that perfect home. Nieko is indeed amazing. He is a little shy at first and we suspect there was abuse/neglect in his past. True to the breed, he absolutely loves children. Unlike most huskies, he not only tolerates cats, but enjoys their company (NOTE: all cats are different and this is true with the two he lives with now, but caution must be exercised with any other possible feline friends). He does exhibit the Siberian prey drive with outdoor animals. Nieko is housebroken and trustworthy in the house. He is currently being treated for a urinary tract infection (UTI) which has occurred in the past. Current testing has identified the cause and he is now being specifically treated for the condition. He preferably will go to a home where he will be allowed potty breaks every four or so hours. Poor Nieko doesn’t seem to know how to play right now; he probably never had a chance. He seems to want to meet and play with dogs he meets on walks, but he was very distressed by loud dogs in a shelter situation. He may be best placed in a home with a quiet dog or as an only dog. Stay tune for more about this gentle, loving Siberian and the latest vet report ~ our paws are crossed that all is AOK!